If these cereals were a movie, it would be an interesting movie with great actors and moments of fun, but ultimately you would walk out of the theater. 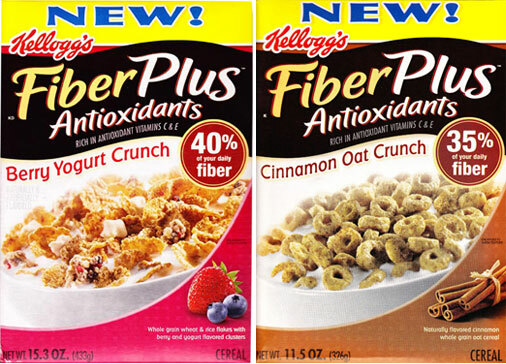 I tried both varieties of FiberPlus Antioxidants cereals: Berry Yogurt Crunch and Cinnamon Oat Crunch. When it comes to fiber and antioxidant vitamins (the cereal industry's clever new way to describe vitamins C & E), these cereals have a very good showing. Berry Yogurt Crunch has 10 grams of dietary fiber per serving (40% daily requirement) and Cinnamon Oat Crunch has 9 grams of dietary fiber (35% daily requirement). Each cereal has 100% daily requirement of vitamin E. Both have 25% vitamin C. Both cereals are low in fat (less than 2 grams total fat with 0 saturated fat and 0 trans fat). Both of these cereals taste good. Berry Yogurt Crunch is the more impressive of the two. With lightly-sweetened, crunchy flakes and occasional extra bursts of flavor from berry and yogurt clusters, this cereal has a certain fun factor. I'd go so far as to call it entertainment for your mouth (re-read the first sentence). The Cinnamon Oat Crunch variety tastes fine, but offers nothing new in terms of flavor. Imagine Cinnamon Toast Crunch cereal crossed with Cheerios and, in your mind, replace 1/3 of the sugar with fiber. It's a satisfying flavor, but nothing to get excited about. Beyond the benefits of fiber and antioxidants, there's an additional health benefit not mentioned on the box. FiberPlus Antioxidants cereals will encourage you to brush your teeth after breakfast. By the third bite of either cereal, you begin to notice a film building on your teeth... a chalkiness. By the 7th or 8th bite, it feels sticky and gummy. As you near the end of the bowl - as the crunchy cereal pieces soften, the overall texture is more than unpleasant... it's gross. If you try either of these cereals, have your toothbrush handy. The "fiber dust" that accumulates in your mouth doesn't go away when you're done eating. I can not recommend these cereals. There's something promising about them, but the recipe is flawed. They remind me of mistakes in a muffin recipe. Imagine making muffins with awesome ingredients, but you accidentally double the baking powder. For all the wonderful aspects of your muffin with awesome ingredients, you can't escape that the extra baking powder added a bitterness that ruined everything. I'm temporarily giving this cereal 3 golden eggs. My gut is telling me 1 and a 1/2, but I want to see what other people think about this chalky film situation. It's possible that my teeth are extra-sensitive to strange films that build up when you're not expecting it. Please post a note below and let me know what you think. The price below represents the price we paid for each box of cereal. What do you think of FiberPlus Antioxidants Cereals? 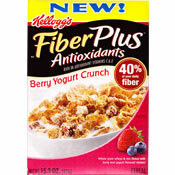 Kellogg's Fiber Plus Crunch Berry Yogurt Clusters is no longer available. 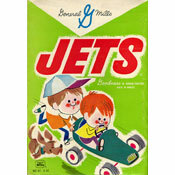 It was my favorite high fiber cereal, but the company says it did not sell enough of it so they quit making it. I guess this cereal sold too well for stores to bother with it, so now it's gone. There must have been some interesting aspect to the cereal for it to be taken off the shelves. It had the highest soluble fiber content of anything else I found. I really loved it! I don't know why it was discontinued. I never felt a film on the teeth... it stays crunchy in the milk for a longer time than other cereals. Love the cinnamon oat crunch - no filminess here. Tastes great and healthy too. Where can I buy this? My Walmart and Kroger have stopped selling them? My zip code is 37398. Thanks! I love this cereal, especially the yogurt berry crunch. Tastes great and is also healthy for you. Unfortunately, I haven't been able to find it at the grocery store (Meijers or Krogers) for the past couple of months. I've tried all three but like the pecan one the best. Also haven't noticed any build up as the reviewer suggests, but I tend to eat cereal quickly before it gets a chance to go soggy. Sadly, all 3 versions are disappearing from the shelves at all my local markets. I think it is the best cereal I have ever eaten, especially the berry yogurt crunch. No film on teeth, but I am reading bad reviews on Internet and wonder if I should continue. They are also taking it off the shelves at Publix. I love this cereal. Lots of fiber. Have a bowl every night before bed. Having trouble finding the Pecan one which I love, but I also love the berry yogurt crunch. I absolutely loved the Cinnamon Oat Crunch until they recently came out with a "Now Tastes Even Better" version. Now it is not very good at all. I almost cried. My entire family has lost their favorite healthy cereal. I love the Berry and haven't noticed any film. I like it much better than Fiber One. Fiber One and Fiber Plus are different brands right? Fiber One products seem like cardboard to me. Fiber Plus' CinOatCru tastes good, but becomes gummy if left in milk awhile. Makes me wonder source of fiber. I threw the box away so can't research it. Will buy again if the ingredients check out. Not really much flavor, a lot of sugar, and Cinnamon Oat Crunch actually has MORE FIBER PER GRAM SERVING than the Yogurt berry one. if your wanting to switch over to a healthier cereal, stick to the original - -Fiber One. Or go Kashi for more natural ingredients. I like it. I am trying to find the healthiest and good tasting cereal, and right now I am sticking with this. After finding out that many of the Kellogg's cereals have hidden trans fat, and hfsc in them, which are not good for us. I love it. I didn't get any film on my teeth. I love Cinnamon Oat Crunch... no chalky taste... once u have it you can't stop!! Prefer the cinnamon oat crunch... but both are very good. I love the yogurt berry crunch. I haven't noticed any film on my teeth. I will only buy this kind of cereal from now on. I haven't tried the cinnamon oat crunch yet, but will do so the next time I shop. I look forward to the cinnamon oat crunch cereal every morning. Sometimes I have 3 bowls of it then as a snack later in the day :). I don't get that film that some reviewers are talking about. Thank goodness costco sells it with 2 bags so I don't have to go to the market every couple of days. I did not have problems with any film on the teeth but I concur that there is nothing new in the flavor. Compared to the Kashi, warm cinnamon, this does not stack up very well. However, it does have lots of fiber and that alone may make it worth eating since the flavor is not bad. I love it. I love it!!! I love this cereal - it's yummy especially the berry clusters! I haven't noticed any film on my teeth either so it just might you! This cereal is like healthy cinnamon toast crunch, it's great tasting and the fiber makes you feel full which is good for me because I'm always hungry - I never noticed any dust on my teeth, maybe your dehydrated and not producing enough saliva. I am addicted to the cinnamon taste. I actually cant wait after work to go home and have a bowl. I give them an awesome rating because it is the first cereal I actually stocked up on knowing I would like it weeks from then. I do not taste the dust till the end of the bag and that is if it all falls into the bowl. They do get mushy rather quickly I have noticed. Great cereal BUT... it makes me have to go to the bathroom about 2 hours after I eat it. Sometimes 3 times a day. I hate that. Love these cereals. The ONLY one my husband and I both agree on (and he hates anything with any nutritional value). No "filmy coating" - but everyone is different. I had to go back and read the box after I had my first bowl because I couldn't believe something so good could be good for you! I have tried both cereals and all of the bars and I love them all. I used to buy the fiber one bars and cereal but decided to try something new. I love the taste of the cereals I eat one everyday for breakfast and sometimes lunch and have lost weight. I never have a film build up after I eat the cereal. I would definitely recommend these cereals. I've recently started trying the FiberPlus Antioxidants products, esp. the bars. They are sooo good and filling. Just tried the Berry Yogurt Crunch and it is delicious! The yogurt pieces taste like Cinnamon and the flakes taste like berries of course. Definitely worth trying! Love it... I do not get the film on my teeth either... and I am not getting any cravings during the day... I am hoping to loose those annoying 5-7 lbs I gained over the winter. They are more affordable compared to fancier high fiber cereals. Only bad thing is I'm kind of gassy. Never noticed the powder. I love cereal, especially healthy cereal. I always look for a good ratio of sugar to fiber when I buy cereal and this cereal has a great ratio. I had the cinnimon kind and it was very good. I did not notice any film on my teeth either. I have recently lost 50 pounds and I owe most my weight loss to increased fiber intake. I usually stick to Fiber One but I went to the supermarket looking for a change. I found the Yogurt Berry Crunch to do the same thing for me in the fiber department as Fiber one. In fact, I have to go to the bathroom, I will be right back... Ok where was I? Oh yeah, I thought the cereal was delicious. The flakes taste sort of like wheaties with the sweetness of special K and the yogurt berries really liven it up. I will definately buy this again and I am excited to try the connamon oat crunch. Never before have I bought a "fiber" cereal. And if it were't for finding out that I have diabetes and trying to eat healthier, I never would have bought a "fiber" cereal. I love Cinnamon Oat Crunch. This cereal doesn't send my sugar into orbit the way that some high carb cereals do. Thanks for making this cereal. I think Cinnamon Oat Crunch an awesome cereal, and I am so glad that I bought it and gave it a try. I would get the bars and eat one each day as a snack so that I could get some fiber in my diet, but now I can just eat this cereal for breakfast. I think that it tastes very yummy. It's not too sweet or tasteless but just right. About the build up, I get that with every cereal so I don't even consider it when reviewing this product. Maybe the satisfaction depends on whether or not you are used to this. I think it's delicious and I will most certainly buy some more when it runs out. The only thing I would be wary of is eating too much of it haha.